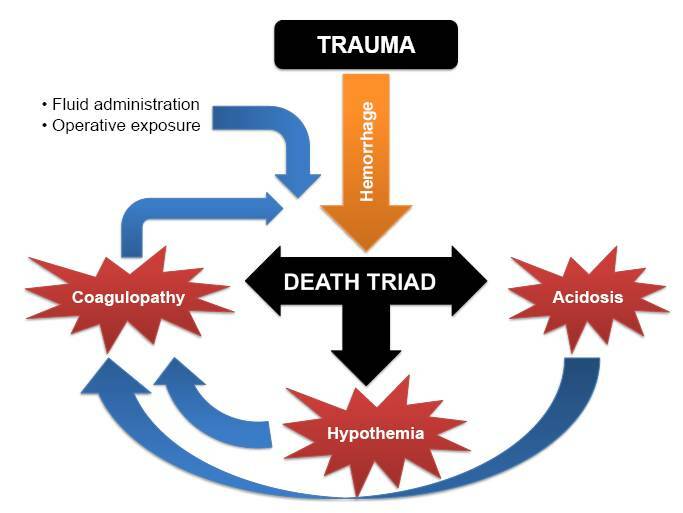 “Damage control” for severely injured patients to provide only interventions necessary to control hemorrhage and contamination to focus on reestablishing a survivable physiologic status. Topics include DCR: surgery, transfusion ratios, permissive hypotension, recombinant factor VIIa (rFVIIa), hypertonic fluid solutions, and the lethal triad of hypothermia, acidosis, and coagulopathy. Keep the blood pressure low enough to avoid exsanguination while maintaining perfusion of end organs. Trauma patients without definitive hemorrhage control should have a limited increase in blood pressure until definitive surgical control of bleeding can be achieved. HTS attractive for its ability to raise blood pressure quickly at much lower volumes of infusion than isotonic fluids and, thus, potentially easier to use and transport into combat. The optimal ratio of FFP to PRBC was 1:1 and that this should be given early in the course. Fresh whole blood transfusion is currently primarily limited to the most severely injured military combat casualties. for all trauma: off-label use! rFVIIa seems to be safe and possibly decreases transfusion in blunt trauma. rFVIIa has not shown any efficacy in penetrating trauma.